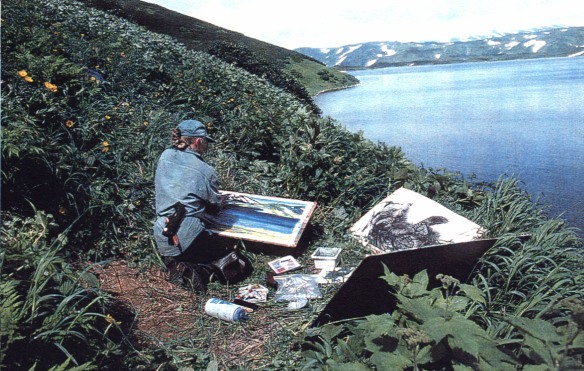 Maureen Enns is an established Canadian artist, internationally known for combining adventure in remote parts of the world with artistic research. She has spent the past six years exploring bear habitat and socializing with grizzlies in the Canadian Rockies and the Kamchatka Peninsula of Russia along with her partner, Charlie Russell. Powerful, dangerous, terrifying, fragile, vulnerable, free, trusting, feeling -through her work we experience her unfolding interpretations of the great bear. How did your career as an artist evolve? "As a young person, I had no idea at all that I would become an artist. In fact, I wanted to be a vet because I loved animals. I got an education degree and was teaching high school when I decided to throw it all away and become an artist. It just sort of came out of the blue with a painting class I took in Ontario. Later I applied to do my Masters degree in Fine Arts and then I was offered a job at the Alberta College of Art when I was a graduate student and I still teach there. As soon as I graduated, I did a sky series about these floating mirrored cubes; I was just absolutely drawn to the Alberta sky. These gained me immediate acclaim across the country which was a big break." "In the Beauty Pageant Series, done in the '80s, I was very interested in what, in the eyes of the dressage community, makes a good horse. Is it what society believes to be the best horse; and then what are the similarities in how we view certain animals and how we view women? So that particular series was about the underdog in the horse world which is the pinto out on the prairie. So I decided to go to Australia and do a desert crossing by camel...from Alice Springs to Adelaide. I photographed and documented the trip and did some work on-site.The Australian series is called "Back and Beyond" which opened at Expo'88 and later toured Australia." 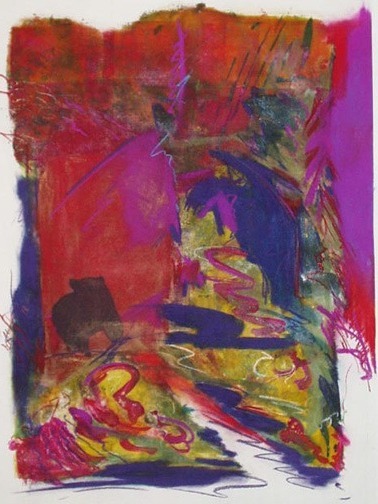 Stylistically, I've noticed that you mix black and white photos or sketches within a very colorful abstract composition. What does this achieve for you? "Part of that comes from the fact I love black and white photography. When I draw a subject, I work from a black and white photo. Also on a more philosophical level... I find with a lot of contemporary art that the average viewer is left out. Something I've always tried to do is to engage the average person that has no formal education in art, so I've always (and that's come right through all my work right to the present) used the literal image as the hook to draw someone in, to get them involved in the subject, and then they can ask questions about - 'what does this abstract material mean and what is emotionally driving that?' Realism becomes the bridge to enter the meaning of the work. It's absolutely critical now because my work [with the bears] has now taken on an educational purpose." I'd like you to talk about how the way you've portrayed the bear in your work has changed over the years? In your earlier works you outlined the bears with borders and you used a great deal of red and black. Why? "In these works the bear is the object, the object of fear. I wanted to portray it as the great signifier of the Canadian wilderness but I was terrified of the bear. The bears are outlined with borders which represent potential violence because that's what I grew up understanding the bear was about. It was an animal that was lurking in the woods ready to kill you. And, this is not what the bear is; it is what it can be." And, as you became more comfortable with the bears, how did that affect your work? "As ideas and images began to emerge, the lines took on new meanings - the red suggestive of the grizzly's aura of power and the white representing freedom and fragility." Then the bears seem to become more prominent and the outlines vanished. "In the works on paper, I struggled to bare its soul, to strip away the powerful exterior and reveal a thinking, feeling being." How is your recent series at Kamchatka different than your previous work? "While studying the bears in 1996, I made an interesting observation. The bears would dig a little hollow in the ground as a place to rest, [which she refers to as nests] and I noticed that although the bears need a good location to look out from for safety reasons, I observed them simply looking out and admiring the view. I began to accept the possibility that bears have an aesthetic sensibility. I came back [to the Kamchatka Peninsula] the next year and did a series called The Bear Who Looked for Beauty. I located a lot of these nests, photographed them, and then I would sit in them at the bear's eye level, look out and try to interpret how the bear perceived beauty." So how does the bear see its surroundings? "When I sat down in the nest to look out I shifted my painting style to show what the bear sees. I decided the bear enjoyed the landscape more as an impressionist painter. So this whole series...is done in an impressionistic way." Can you tell me more about the entire series? "I produced an exhibition of three parts, which I exhibited in Petropavlovsk. The first segment of paintings were of the sites. I sat above the nests and painted them as I perceived them. Then I would sit in these nests, imagining that I was a bear, allowing the energy of the surrounding area to influence my style. The final component was a line of six drawings of the cubs in the nests." "These are acrylic paint, charcoal, oil paint, everything." Did you produce this series on-site or in the studio? They are all done outside...I find if I go back into them too much, they are destroyed. I start intellectualizing them and I really have to use the intuition. So after the Bear Who Looked for Beauty Series, you have gone one step further. Now you're conveying how you think a bear thinks and experiences emotions in a much more abstract way. "I call this series Psychological Spaces. 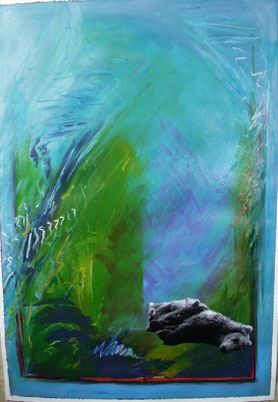 There is a whole emotional world of a bear that is so evolved, in fact, I think that they are more sensitive than humans in many ways, but it's a world that I don't know...This whole series has concentrated on this doorway to another world, and that is the bear's world. Now that I have formed a relationship of friendship and trust with [our three cubs], I think I can start interpreting their emotional world." Maureen's latest series will appear in a show titled Through the Eyes of a Bear at the Muttart Museum in Calgary over the next year. (A date is yet to be announced). People will enter the exhibit by walking in the tracks of a bear. "I'm setting up an installation piece where I squish this [cast of a bear track] in to clay or some other material," says Maureen. "I am working with a Calgary ceramicist, Megan Evans, on this." What are the rewards you have experienced as an artist working in the outdoors? "What have I gained the most working on the Kamchatka project where I am outside all day long and painting outside? This harks back to the Group of Seven and that romantic era, paddling a canoe around Algonquin Park. I remember hearing Buck Kerr talk about how, when he would go out and work outside, he became part of the wilderness. I had always thought I was a part of the wilderness, but I found that by actually sitting in the nesting site of a bear and deciding to allow whatever I saw and whatever I was feeling to sort of pour through me and come out onto the paper...when I allowed that to happen I became a part of the planet on a level that wouldn't have been possible any other way. It has altered my whole life." 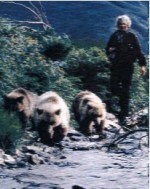 In 1993, Maureen completed her book Grizzly Kingdom and her earlier artistic grizzly explorations. This book is a story of "Maureen's struggle to find bears in the wild and, to reveal, on canvas and film, this majestic symbol of a fragile wilderness." At this time, it was a mutual interest in bears and their interaction with humans that brought Maureen in contact with Charlie Russell, a prominent wilderness guide and photographer. It became clear that they shared the same respect and passion for the grizzly. This lead to the Kamchatka Project. In 1994, with a grant from the Great Bear Foundation in Montana, Maureen and Charlie went to the southern tip of the Kamchatka Peninsula in the Russian Far East, on a reconnaissance trip to decide what they wanted to do with their research and to look at the poaching of bears. 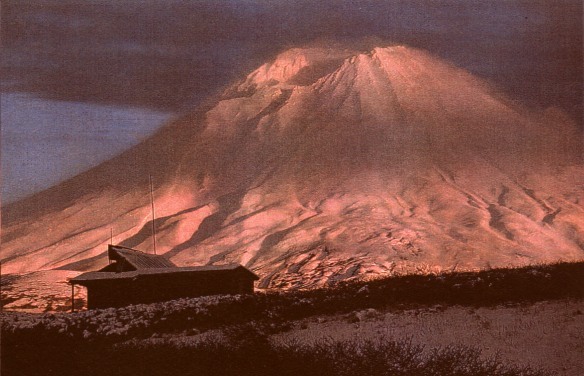 They came back and raised enough money to return in 1996 when they built their cabin at Kambalnoe Lake at the base of the Kambalnoe Volcano. The 1996 trip was spent observing the behaviors of the bears in relationship to humans like themselves. In this remote region of the Russia bears rarely, if ever, have contact with man. By the end of their 1996 trip they had two bears that became quite trusting of them. At Kambalnoe in 1997, Maureen and Charlie raised three orphaned cubs: Biscuit, Chico, and Rosie. Their cub reintroduction program has been a marvelous opportunity to test some of their theories of bear/human interactions. Maureen and Charlie have experimented with body language, inflection of sound and voice, and eye contact. Charlie contends, "Your best defense around a bear is your own voice used calmly and reassuringly." He and Maureen have also looked at the problem of keeping bears out of human food and garbage. They are developing a simple method for using electric fencing in the wilderness to keep bears out of food and tents, with the hopes of introducing it to back country campers. They returned to live with the cubs in May of 1998 to find them living quite independently but still exhibiting a lot of trust and interest. Charlie believes that "the ultimate culmination of the study would be when they have cubs of their own. I anticipate that the trust we have developed will go so far that they will have those cubs around us all the time." Charlie Russell is currently writing a book summarizing their three years of research. Maureen Enns is going to be working on a video project titled "In Situ" - a geological term meaning "leave it alone in its place," which is generally how she feels. "I believe that we should take a look at some places on the planet and...that we do not open them to the public, and that we leave them to the animals. I think this spot, Kamchatka, is one of them." 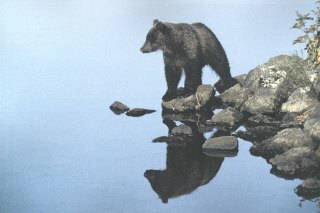 For more information on the Kamchatka project visit their website at: http://www.norquay.com/grizzlies. Maureen and Charlie will be giving a talk in conjunction with CAOC.